At the beginning of this year my son became fascinated by sharks so I decided it would be a good learning topic for him and he has really enjoyed it (well he is still enjoying it as it is an ongoing topic). Even though we are still working through our Shark Topic I thought I would share some of the learning pages that he has used and liked up to this point. I actually found a Shark Lapbook on the Twinkl Resources website (part of their subscription) and it has some great items included in it but my little guy has decided that he wants to write his own animal book this year, so he is no longer interested in lapbooks. He is going to collect different items that he finds interesting about his favourite animals over the next few months and then use them to create his own book. He chose a few items out of the Lapbook set and made them up and then stored them in his animal draw so he can later include them in his book. The first one he selected was the Parts of the Shark flapbook. He thought the booklet was cool but he wanted a bit more detail so he decided that he would create his own shark and label it himself (the shark picture he used is one he traced from the Shark Colouring Sheets). 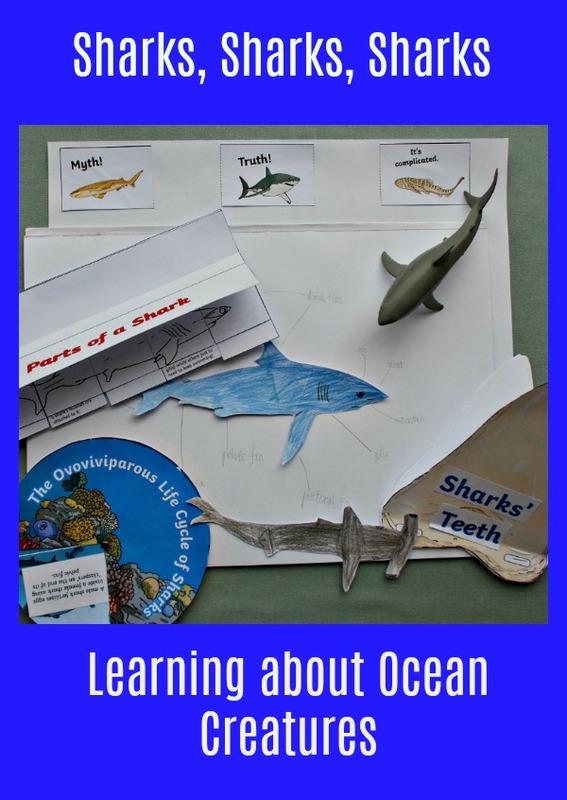 He then went onto the Sharks Teeth book (included in the lapbook set)- we actually added a few extra blank pages into our booklet so he could included his own facts as well as the facts included in the template given. And the Shark Myth or Reality set – on the website this set is actually a sorting activity with little pockets to place the cards in but he used the cards to create his own Fact or Fiction Poster instead. He also liked the Sharks Book of World Record Activity and the Life Cycle Resource (both part of the Lapbook resources). He made up the Life Cycle wheel using the information cards that are included but he also asked me to print the extra blank template as he wants to create a wheel with his own facts aswell (I really liked that they included a blank template in the Life Cycle Set). And the Comprehension – I was very surprised when he asked to try the Sharks Comprehension as normally he tries to stay clear of written work but he liked the fact it was all about Sharks so he had a go. This is still an ongoing topic for him but I wanted to share some of the resources that he has found useful up till this point. I am really hoping that his new determination to write his own animal book does not die down and he continues planning his animals and resources to include in his book, it is such a fun way of learning about animals while also encouraging him to write more. Other posts which cover our Sharks learning topic are – Sharks a Chapter Book and our Tracing Post. I was given a Twinkl Resources subscription last year for us to use as part of our home education and so that I can share which resources we like and find useful. This entry was posted in Homeschooling and tagged animals, home ed, home education, homeschooling, oceans, science, sharks, Twinkl. Bookmark the permalink.